Categories: Espanol, For Kids, International. Cada Ojo Magico tiene una imagen tridimensional escondida dentro, de lo que a simple vista, parece un dibujo comun y corriente. El truco esta en encontrar la imagen escondida, que si se mira con atencion por unos segundos aparece ante los ojos del lector. Cheri Smith is the president and creative director of Magic Eye Inc. Cheri has always been fascinated with 3D, and has been a 3D photography enthusiast since 1980. She holds a BFA degree from Framingham State College, Framingham, MA (1979), and attended many postgraduate courses at additional colleges including the Museum of Fine Arts School and Massachusetts College of Art in Boston. Cheri worked as a graphic designer before becoming a computer graphic instructor. Later she worked as a freelance artist for additional computer graphic and animation studios. 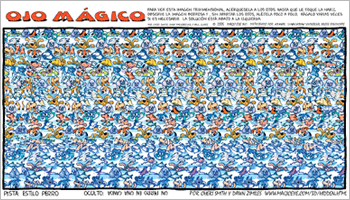 Prior to co-creating Magic Eye in 1991, Cheri received several national and international art awards. She loves creating Magic Eye images, and equally loves watching people view them. One of her favorite pastimes is reading email sent by Magic Eye fans. Dawn Zimiles received her BFA in Sculpture from Parsons School of Design in New York (1991). She then moved to San Francisco where she immersed herself in the computer graphics revolution of the 1990's. Here she worked on numerous Multimedia and Web design projects, was a computer graphics instructor, and specialized in creating 3D models and animations. Dawn currently resides in Provincetown, MA, where her passion for computer technology and art continues to grow. 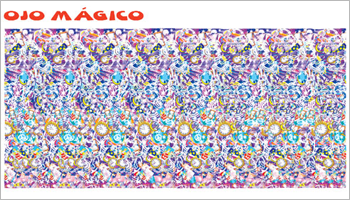 She has been overjoyed to be working for Magic Eye since 2002.